→A Look At The Soil Machine PRO Composter by Good Ideas Inc. The Good Ideas Soil Machine PRO let you create compost and tea at the same time. While compost can be added to soil or used as a soil alternative, tea can be used to water your indoor and outdoor plants. It can help create the ideal balance of microbes in and around your garden. The SMP is made from recycled polyethylene, adding to its eco-friendly characteristics. The barrel rolls along the base, so turning it is easy. Simply grab the handles and agitate the bin. This is perhaps a little harder to rotate than tumbler-style compost bins that are attached to a steel frame, however. The SMP is made of two main plastic pieces. The barrel contains a 12-inch lid that screws on and off to reveal the opening for adding and removing compost. The barrel sits on a base, which collects tea and allows the barrel to rotate more easily. The product comes with a spout that must be inserted into the base for collection of compost tea. You can tip the base to encourage the liquid to flow out of the spout into a collection container. You can also connect a soaker hose to the spout to water your garden. Because the bin doesn’t open toward the ground, it doesn’t allow bugs, rodents or snakes to get into the material. While this is beneficial for making sure that you’re not attracting vermin into your yard, it also prevents useful microbes and earthworms from entering to help with the decomposition process. However, the dark color absorbs heat, which helps the soil develop more quickly. Ventilation holes in the sides allow for oxygen to flow easily. The bin is about 32 inches long, 24 inches deep and 24 inches tall. It can hold seven cubic feet of compost or waste materials. Once you place it in your yard, it is difficult to move, especially as you fill it with material. Fully assembled – You don’t have to do much to put this bin together. It arrives in two main parts. To complete the assembly, you simply have to wrap Teflon around the threads of the spout and insert it into the base. Rotating tumbler – There is no need to use a shovel to manually turn and aerate your compost. Simply grab the handles and pull the barrel toward and away from you a few times to agitate the soil inside. Make compost tea – You can collect up to five gallons of compost tea in the base. Use this to water your lawn, restore the pH of your soil, feed your plants or control pests and disease. Maximize heat – Although this bin is not insulated, the dark color will absorb sunlight and transfer it to heat energy. This keeps the interior of the bin hot enough to maximize compost development. It works better when it is used in sunlight, especially in the colder months. Compost may be hard to remove – You can’t dump out the material as with other tumbler﻿ composters. Because the opening is only 12 inches in diameter, you will need a smaller shovel to remove the finished soil. Difficult to turn – Although you don’t need a shovel to aerate your compost, rotating the barrel can become more difficult as the bin fills up with waste. Don’t fill it with large items – The small opening makes it difficult to add larger items, like branches and twigs. Large footprint – The horizontal design is not as compact as some of the vertical bins. Is This Composter Right For Me? It's Affordable - This is not the most expensive bin. It’s also not the cheapest. Falling in the middle ground in terms of price, it’s an effective starter bin. If you want to be able to add larger pieces of yard waste, however, we would recommend starting with a larger bin. It's Easy To Manage - This bin is also useful for people who don’t want to heave large loads of compost at a time. You’ll need a relatively small shovel to remove compost from the opening. That means that you won’t need to do much heavy lifting. It Creates Compost Tea - The fact that this barrel creates compost tea is an added benefit. Using a soaker hose with the attached spigot is the ideal way to harvest the tea. If you don’t have a soaker hose, you’ll have to slide a shallow container underneath the nozzle to harvest the tea. 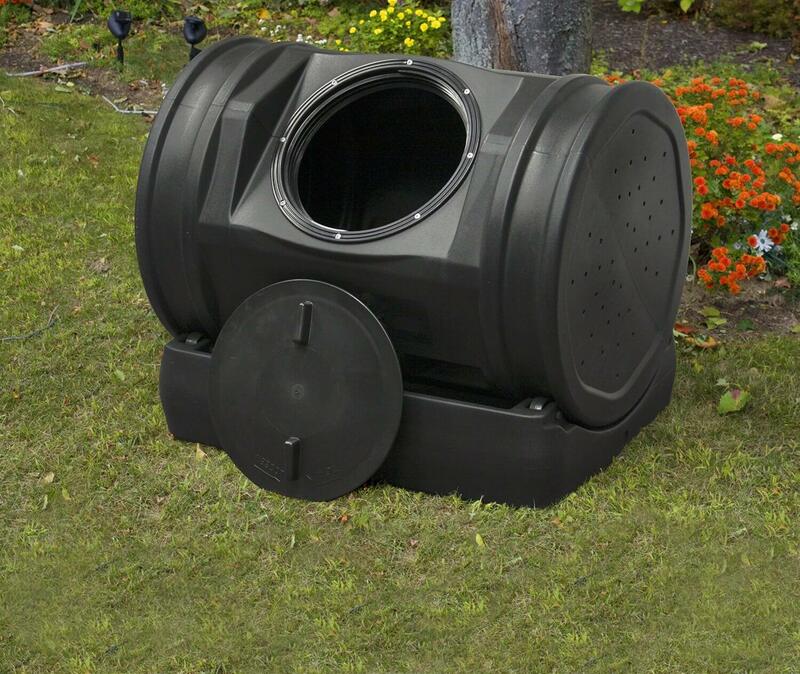 This product is a lightweight bin that makes aerating your compost simple. The easy-to-grasp handles on the bin let you agitate the barrel to turn it. Most users do this on a weekly basis to adequately mix up the material. As you add waste, the bin becomes heavier and more difficult to turn. If you need to move it to a different spot in the yard, however, that’s easy to do once the bin has been emptied. On the other hand, this composter can still be useful for people who mainly have kitchen scraps to turn into soil. You can layer kitchen scraps with shredded paper to create smaller batches of usable compost. Because you can turn the bin regularly, you can enhance the decomposition process even though you don’t have a lot of pressure helping the materials break down. For the price, you could always get a slightly fancier compost bin. 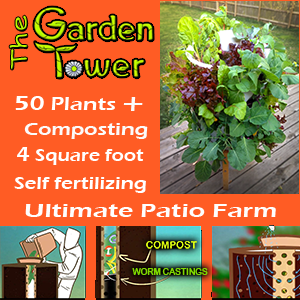 However, if you don’t want something complicated and don’t want to spend a lot of time sifting through or aerating your compost, this is a basic model that will get the job done and is simple to use.